A local deep port operation has pled guilty and was subsequently fined $27,500 for contravening the Environmental Protection Act in Picton’s provincial offences court Friday morning. Picton Terminals was before Justice Ernie Parsons at the King Street courthouse and entered a guilty plea to Section 14 of the provincial Act, namely, allowing a discharge of a contaminant into the natural environment, if the discharge causes or may cause an adverse effect. The plea comes as a result of a 2016 discharge of petroleum coke (petcoke), a carbonaceous solid delivered from oil refinery coker units or other cracking processes and used in commercial applications as fuel source including the production of cement. According to the U.S. Environmental Protection Agency, significant quantities of fugitive dust from pet coke storage and handling operations present a health risk and, once inhaled, tiny particles 10 micrometers in diameter or smaller can affect the heart and lungs and cause serious health effects. The charges stem from a discovery made by neighbouring White Chapel Road residents Anne Taylor and Jack Vanderholst in October 2016. 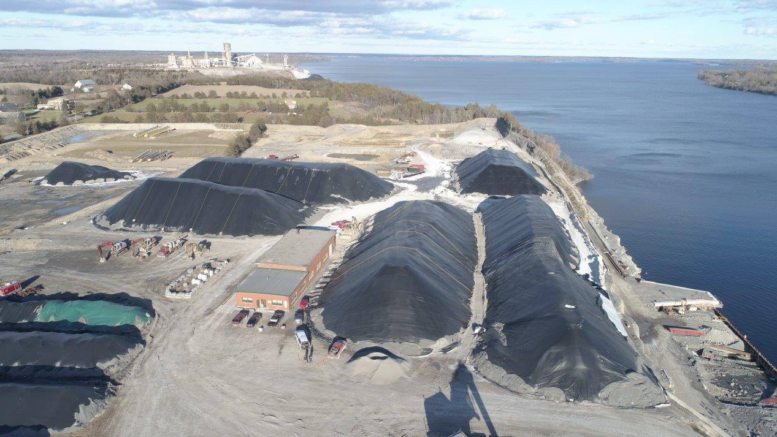 Picton Terminals was stockpiling the materials at their White Chapel Road site and the petcoke was destined to be utilized at the Lafarge cement plant in Bath. Despite allegedly following standard petcoke storage and handling procedures which included wetting of the product to halt rogue emissions, petcoke dust was found inside the Taylor and Vanderholst home and a pool at the neighbouring property. To its credit, Picton Terminals did undertake remediation work, site restoration and duct cleaning at a cost of $6,400. The offence was the first EPA violation for Picton Terminals since the company started ramping up operations at the former Bethlehem Steel iron ore transfer site that was built in the 1950s and operated into the 1970s under that ownership. In the 1980s and 1990s the site was used as a transfer site for bulk sodium chloride stores, a use Picton Terminals has carried forward since securing the property earlier this decade. Members of Save Picton Bay, a group critical of Picton Terminals’ operation were at the courthouse on Friday and were disgusted with the fine imposed by Parsons which was a joint submission arrived at by Picton Terminals lawyers and attorneys representing the Ministry of the Environment. “It’s a slap on the wrist, and it might be a first offence here but it’s indicative of an attitude,” Wendy Murphy said, pointing to instances in other regions where Doornekamp Construction, ABNA Investments and Hendriks Aggregates have been fined for violations by the Ministry of the Environment or Ministry of Natural Resources over the past decade. Fines for an offence contravening Section 14 of the EPS range from $25,000 to $6 million. Picton Terminals was given 12 months to pay the fine, another aspect which Murphy also found insulting. Murphy added the group is hopeful for more expedient action when it comes to a pair of matters currently being investigated by a pair of governmental branches. Lags in covering bulk sodium chloride stockpiles in an agreed upon time frame is being looked at by the province while salt-infused stormwater run-off discharging into Picton Bay is being examined by Environment and Climate Change Canada. An ECCC spokesperson told the Gazette Tuesday afternoon that enforcement officers continue to gather information to determine whether any further action is necessary. “As this is the subject of an open enforcement file, we cannot comment at this time,” Christelle Chartrand said. In other Save Picton Bay news, the group is appealing a decision handed out in Superior Court last month regarding the interpretation of Prince Edward County’s zoning bylaws. Justice Wolf Tausendfreund handed down his verdict, stating Picton Terminals could continue to operate as a legal, non-conforming entity. Tausendfreund upheld Picton Terminals and the municipality’s understanding that, at the time the County of Prince Edward enacted its present comprehensive zoning by-law in 2006, the portion of the property located in the former Township of Hallowell became and remains a legal non-conforming use for transshipment of bulk commodities. Save Picton Bay challenged the County’s legal position on the zoning, saying the operation contravened the County’s own bylaw. Save Picton Bay’s lawyer Eric Gillespie will be at the Picton Town Hall on August 18 at 2 p.m. to explain Tausendfreund’s ruling and the next steps in the appeal process.